Jake Ball believes Outlaws are building something special, Paul Franks is cautiously optimistic and Samit Patel is tipping Ben Slater for great things in a Nottinghamshire jersey. 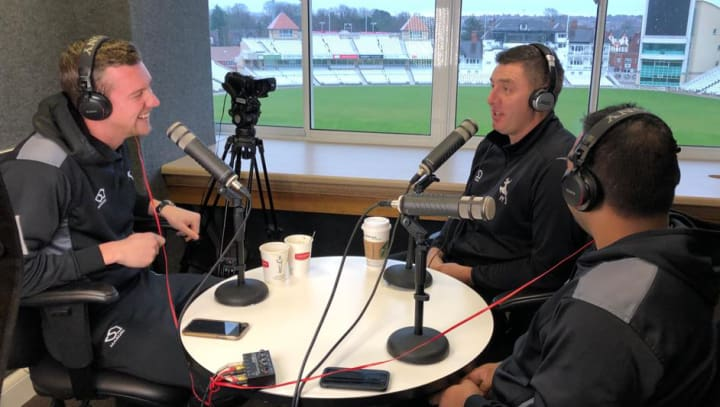 The stalwart trio were united around a cluster of microphones for the latest edition of the Talk of Trent Bridge podcast. Host Ball made mention of the terrific vibe around the squad, while Patel - who has seen many a change in personnel during his time with the Club - picked out former Derbyshire opening batsman Slater for particular praise. “This is one of the most exciting crops of players we have brought in,” said Patel. “The one who is really exciting me at the moment is Ben Slater. From the way he played at the back end of last year to seeing him in action during the winter, I think we are going to see a different side of him this year. Ball added: “I’ve been around all winter and I’ve got the vibe that there is a really great energy around the team. Whilst Nottinghamshire’s most recent silverware successes both came in the white-ball game in 2017, both Franks and Patel have been part of two triumphs in the County Championship, in 2005 and 2010. When asked of the side’s chances in the coming years, Franks urged caution but admitted he can see plenty of potential in the current squad. Franks added: “The championship is the ultimate test of any player with it spanning the whole season. “I think we should all be excited. It won’t happen just like that, everything needs a bit of time to come together. “But if you look at the average age of the squad, it has come down a lot in the last few years, which every side experiences from time to time. “You lose the former Club Captain in Chris Read, and Brendan Taylor with all his runs and experience, and the scales all of a sudden start tipping. “We’re really encouraged about how we have recruited – and that’s based on the fact that they were the best young players around and we got all of them. “They wanted to come and play for us, which is testament to you lads, the dressing room, the ground we have and because of that I think you will see some really exciting cricket. “On top of that, a few of our senior Academy lads are in a place where they can threaten for places in the first team, which is something we haven’t had consistently in the past.